The 5 Health Benefits of Friendship! 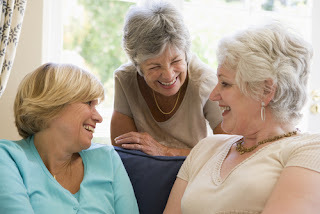 We value our women friends for many reasons—companionship, validation, advice and more—but did you know that your friends can also contribute to a longer and healthier life? It’s true! Here are the 5 ways our women friends boost our health. Women friends can encourage and support healthy habits. One report maintains that those with a network of friends are more likely to make and stick to positive choices such as eating more fruits and veggies and exercising regularly. This is especially true when you share your fitness goals with your women friends. If you have a friend who is trying to lose weight by avoiding sweets, you’re definitely not going to take her a plate of fresh-baked cookies. Save those for the office or book club. Likewise, a good friend may encourage her friend’s fitness goals by suggesting a walk after work, rather than a drink and apps. Not surprisingly, many women also make new friends through health-minded activities such as a hiking group or a cooking class. And germaphobes take note: Researchers have shown that people who report having a solid network of friends tend to have stronger immune systems and don’t fall ill with infectious illnesses as often as those with fewer friends. So make sure to keep your hand sanitizer close and your friends closer during flu season. Sure, you turn to close friends when you need to vent frustration, to find solace, to help decide which direction to head. It feels good to know that your friends have your back. But did you know that support from your women friends not only provides emotional comfort, it has an added physical benefit as well. Your friends help you chill—physically! A landmark study showed that having a circle of friends helps women bond rather than isolate themselves in stressful times. When women gather and support each other, they release more oxytocin, which is a calming hormone. Men, on the other hand, more often find their ‘fight or flight’ reflexes activated by stress. But read on for even more good news about the curative power of friendship. All of us have found ourselves in situations without a familiar face in sight. Perhaps it’s your first morning at a new job or the first day you’ve mustered up the courage to join a boot camp. Chances are, you’ll exchange a smile or some encouraging words with someone that day who could turn out to be a new friend. Why is this important? Because while there’s proof that our current friendships add to our quality of life in many ways, health professionals also believe that making new friends helps our brains release more of the mood-boosting hormone dopamine. So it physically feels good to build your social network. What are you waiting for? Get out there and make more dopamine! What was supposed to be a romantic getaway for my neighbor Elaine was cut short when she took a tumble from her mountain bike and broke several bones in her foot. Even before she received the news that she could put no weight on the foot for months, a group of women friends from her synagogue had organized meals and rides and the like. We may never know if that support contributed to her quicker-than-expected healing, but I’m certain it gave her peace of mind—which is no small thing when life throws you a curve. But don’t just take my word for it. There is evidence that women with a close circle of friends recover more quickly and live longer after a major event such as a heart attack. Think of it as a new prescription for good health: Call on your friends when you need extra help and be sure to extend a helping hand to a friend in need. My friend Stacy and I lost touch after she moved out of state. We’d been very close 16 years ago when we were both starting families and I have wonderful memories of holding each other’s newborns, celebrating birthdays, taking the kids swimming and sledding (not in the same day!) and the like. But sitting at her kitchen table last month and catching up, a flood of memories came back for both of us. I remembered the handful of names they considered for their youngest. She remembered the Halloween the girls dressed as Teletubbies. We both laughed until we cried at the memory of me fainting during the birth of her middle child (I unconsciously held my breath every time she had a contraction and finally passed out!) So many years had passed since those early days of parenthood and all it took was one meal to take us back. And that is what makes old friends so very special—the unique ability to remind each other of the times in our lives that shaped who we are today. I will always welcome making new friends. But old friends are truly like a bend in the river: altering the river’s course and moving rocks along the riverbed. And the memories you share are like the sediment left behind by the water’s flow. As it turns out, a strong social network helps preserve our memory and can slow the onset of dementia as we age. Some believe this is because remembering and keeping in touch with our friends exercises our brains and keeps the neural pathways intact. And all it takes is making memories and sharing them. And the ultimate medical breakthrough? You’ll live longer if you grow your network of friends. Yep. A 10-year study of 1,500 seniors revealed that those with wider net of friends lived a whopping 22% longer than those with fewer friends. The research also revealed that having good friends was even more important to longevity than having close relationships within your family. This is good news because you can always increase your network of friends, but your family is limited. (A great reason to join and be active on SocialJane.com). It’s clear that we need far more than leafy greens and a gym membership to keep us our fittest. We need our friends. They help us weather difficult times, encourage us to be our best, surround us when we need support, help lower our stress levels and preserve our memories. The best medicine? Friends.